With heightened interest in even less invasive surgery, single port laparoscopic colorectal surgery is quickly gaining acceptance. While this access technique was first described in 2008 for colorectal resective procedures, large series are lacking. 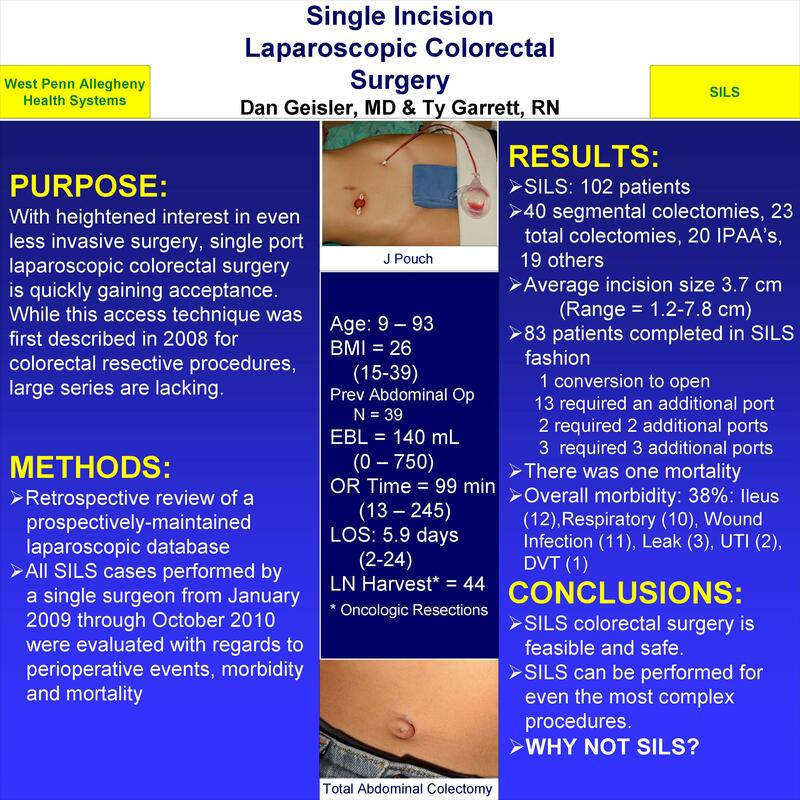 Between January 2009 and September 2010, all patients undergoing single port colorectal surgery by a single surgeon were prospectively entered into an IRB-approved database and studied with regards to perioperative events, morbidity and mortality. 99 consecutive patients (Age 9-93) underwent single port colorectal procedures with 1 conversion to an open operation. 30 patients had previous abdominal surgery and the average BMI was 26 (15-39). 12 patients required placement of additional ports (1: N=9; 2: N=1; 3: N=3). Primary diagnoses included ulcerative colitis (46), neoplasia (17), Crohn’s disease (10), diverticulitis (10), FAP (2), and other (14). Average OR time was 105 minutes (13-245) and mean length of incision was 3.7cm (1.2-7.8). Procedures included 26 total colectomies, 37 segmental colectomies, 23 IPAAs, and 13 other. Mean lymph node harvest for oncologic resections was 44. There was 1 mortality. Overall morbidity was 38%. With proper patient selection and laparoscopic experience, SP can be performed for even the most complex colorectal procedures. Further studies are warranted.